I thought I'd end this month of salads with pasta salad, the only real salad both of my kids will eat. 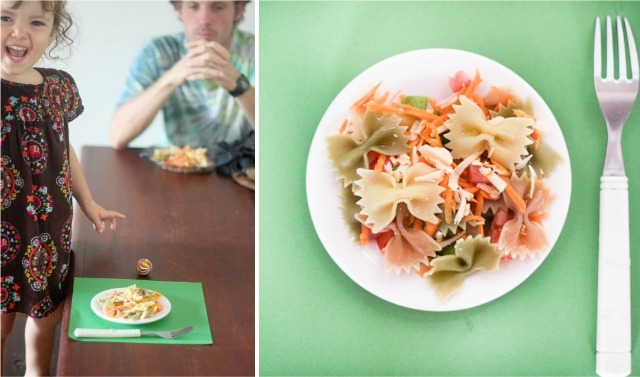 Pasta salad is the ultimate family friendly salad recipe, don't you think? I can't believe we're already 31 days into 2012 and that tomorrow is February. I am so excited for February. I get to celebrate 9 years of having Christian in my life. I get to celebrate Carnaval in Brazil with my mom, my older sister, and my nephew Bruno, all coming out to visit us for a week. I also get a new niece and a new nephew due any day now. Then it's March and I'll turn 29 and start the countdown to 30. Crazy. There are lots of good things to look forward to, but mostly a lot of good things to appreciate now. I want to thank all of my guest bloggers, my friends, who wrote a salad post this month on Kitchen Corners. Thanks for giving me a bit ( a lot, because I know it takes a while) of your time to create something tasty for Kitchen Corners. I also want to thank my readers who have been supportive, who have left comments, pinned, tweeted, Facebooked, Stumbled, etc and have helped make this month a great one. To the moon and back thank you. 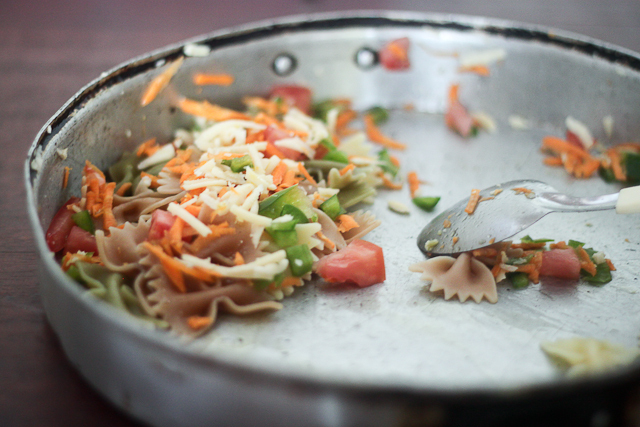 Mix the cooked pasta with the diced veggies and cheese. Drizzle olive oil and season with salt. Serve cold.